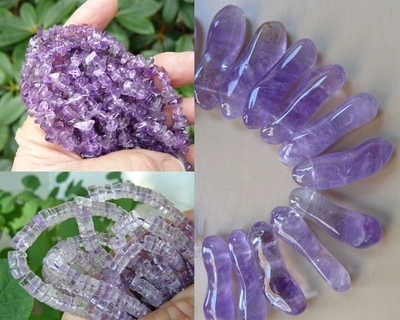 Amethyst Beads - Round, Square, Chunky, Faceted and more. Home > -Gemstone Beads, Amber, Amethyst, Labradorite. Gem Beads From A to Z > Amethyst Beads - Round, Square, Chunky, Faceted and more. Amethyst is a purple variety of quartz. Though it is mostly mined in Brazil, amethyst can be found all over the world including South Korea, Russia and the U.S. as well as several other locations. To the Greeks, it was considered to be an antidote to intoxication which is the reason for wine goblets carved from the stone.